Recently I traveled to Toronto to run the marathon. The length of my stay was just right and allowed time to sightsee before and after the race. Staying in city centre meant that places of interest, such as museums and shops, were within walking distance. This post was originally going to be about my visit to Art Gallery of Ontario (AGO), but I took so many images on the walk to AGO, that I’ll split into two separate posts. Henry Moore’s Large Two Forms in Grange Park is captured in the images above. 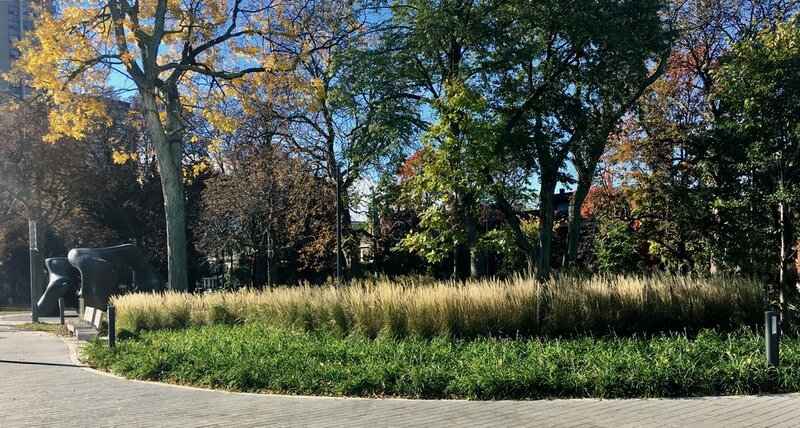 This article in Urban Torronto describes the relocation of the prominent sculpture from Dundas and McCaul to the renovated Grange Park. The blue titanium panels on the back elevation of the AGO is visible from afar as well as through the Henry Moore sculpture. Adjacent to AGO and Grange Park is OCAD, Toronto’s largest and oldest institution for art and design. The striking Sharp Centre for design consists of a box four stories off the ground supported by multi-coloured pillars at different angles. Of course, I traversed the circular staircase at the back of the museum to view Grange Park from above. I look forward to my next visit to Toronto and another walk through the park.